There is a lot of information available on the life and descendants of Rev. Joseph Rhea. This is a most fascinating story from Fahan, Ireland in 1700s to USA today. Some examples are available by following the links on the left of this page. 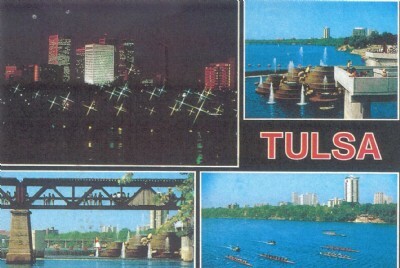 Located onthe banks of the Arkansas River, Tulsans take pride and great pleasure in the seven miles long scenic playground, THE RIVER PARKS. Dear Mr & Mrs Lamberton, Thabk you for your kindness and hospitality. 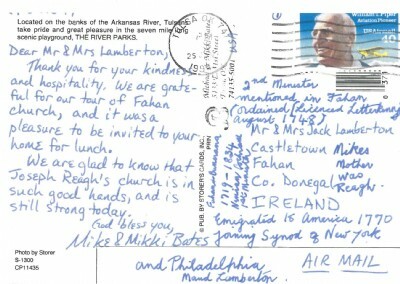 We are grateful for our tour of Fahan Church, and it was a pleasure to be invited to your home for lunch. We are glad to know that Joseph Reagh's Church is in such good hands, and is still stron today. God bless you. Mike & Mikki Bates. (Note added around edges by Maud Lamberton, Fahan: 2nd minister mentioned in Fahan ordained (Licenced Letterkenny). Emigrated to America 1770, joining Synod of New York and Philadelphia. Mikes mother was Reagh. Fahan Buncrana 1719 to 1834 Ninian Cochrane 1st Minister. Caution: Some of the informat ion was extracted from difficult to read documents so may contain some spelling or date errors. We suggest you validate any information from a more accurate source before using.